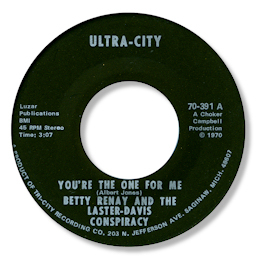 Choker Campbell was the man responsible for quite a big percentage of the hard edged R & B tinged soul that came out of Detroit in the 60s and early 70 – and this one-off by Betty Renay on his own Ultra-City label adds to a very strong CV. “Money Honey” is a bluesy mid paced toe tapper with a tasteful horn-rich arrangement. You’re The One For Me is a deep ballad on which Betty is suitably emotional, accompanied by some fine male harmonies and a rather jazzy arrangement which moves from dead slow to some double timed passages and back again. Very tasty!